The Asterales are an order of dicotyledonous flowering plants which include the family Asteraceae (usually known as sunflowers and daisies). The Asterales has about eleven families. Asteraceae is the largest family and includes about 25,000 species. Campanulaceae has about 2,000 species. 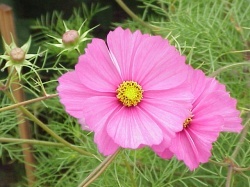 The flower petals of the order Asterales are joined together by their margins, forming a tubular corolla. The fruit of the Asterales is tiny with only one seed. Asterales species are distributed by wind. The ovule is the best single feature distinguishing the Asterales because the ovary has only on seed cavity, with a single ovule arising. Also the Ovule is curved back on itself. A relatively few species are regularly self-pollinated, so bird pollination is also uncommon. But Solidago speciosa, the Goldenrods is pollinated by both wind and insects. Asterales produces tiny dry fruit with one only seed called an achene, for example the sunflower. The fruit of the Asterales also does not open at maturity. the hull is the achenial wall, and the proper seed coat surrounding the embryo is thin. The seeds of many Asterales species are distributed by wind. The pistil of the Asterales flower is composed of two carpels, united to form a compound ovary with a terminal style. 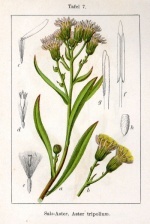 The order Asteraceae includes some of the species grown for food or chicory also can used for medicinal herbs. The two large families (the Asteraceae and the Campanulaceae) are cosmopolitic with center of mass in the northern hemisphere. And the smaller ones are usually confined to Australia and the adjacent areas, or sometimes the South America. This page was last modified on 6 September 2015, at 20:35.